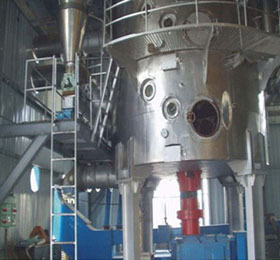 Desolventizer toaster dryer cooler (DTDC) is used to separate solvent from wet meal in the solvent extraction plant. KMEC's desolventizer toaster dryer coolers have five layers. The first and second are preheating layers which function using an indirect current of steam at the base. The third layer is pre-desolventizing layer which leads to the fourth, main pre-desolventizing layer. The last layer dries the material. Steam injection methodology ensures that less water vapor escapes, thereby reducing energy consumption. The desolventizer toaster utilizes airtight conditions with a uniformly administered current of steam. This greatly reduces the amount of residual solvent in the meal, particularly in comparison to traditional ddesolventizing equipment. The DTDC vapor temperature can be automatically adjusted by adjusting the volume of direct steam.